Leading charitable organisation War Child UK, together with Bethesda Softworks®, a ZeniMax® Media company, and Metropolis Music have announced War Child UK Presents Bethesda Game Studios in Concert, a night dedicated to live music from the award-winning video game developer at the London Eventim Apollo, Hammersmith on Saturday, 3rd November. 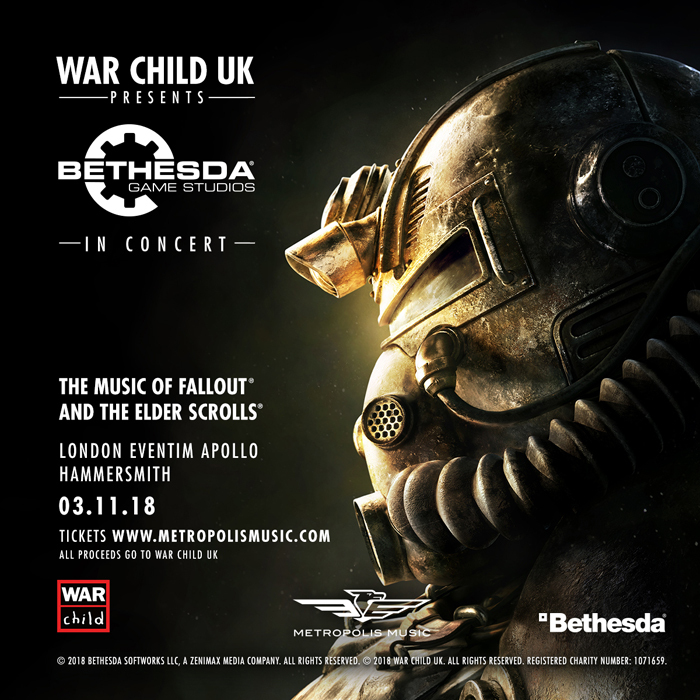 Forming part of War Child UK’s Armistice in 2018 fundraising series of events, Bethesda Game Studios in Concert will be performed live by the Parallax Orchestra and Choir, and features a show packed with the music of Fallout® 3, Fallout® 4, The Elder Scrolls V: Skyrim, and the forthcoming Fallout® 76, among other surprises. It will be a musical evening not to be missed! Bethesda Softworks is excited to be working with War Child UK on the concert, an organisation that strives for a world where children’s lives are no longer torn apart by war, and is delighted to announce that all proceeds from ticket sales for the show will go to the charity. Tickets for the concert go on sale beginning 12th September at 9am, with ticket prices starting from £45. In addition, there are two VIP ticket options that include preferred seating, exclusive merchandise, a page from the Fallout 76 score signed by composer Inon Zur and a limited number of post-show Meet and Greet tickets with the composer himself, who will be attending the concert. For more information on War Child and the work it does supporting children in areas experiencing conflict and the aftermath of conflict, please visit www.warchild.org.uk. Fallout 76 launches 14th November, 2018 on Xbox One, PlayStation® 4 computer entertainment system, and PC – for more information, visit http://www.fallout.com. For more information on The Elder Scrolls series, visit http://www.elderscrolls.com. Copyright © 2019 Inon Zur. All Rights Reserved.